This is the twelfth in a series of guests posts that feature Archtober Building of the Day tours! 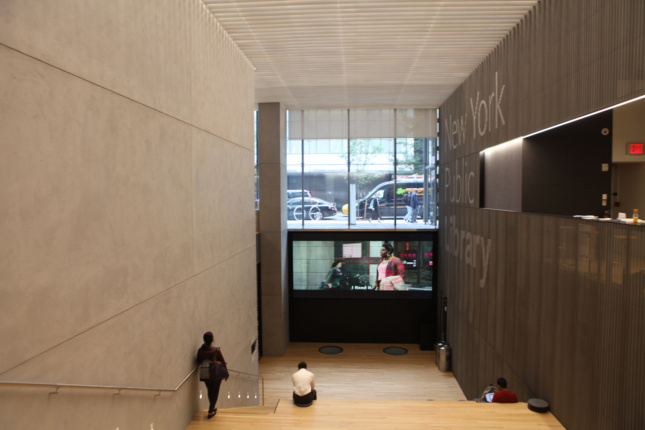 This afternoon, Andrea Steele, principal of TEN Arquitectos, led the thirteenth Archtober Building of the Day tour, an informative visit to the New York Public 53rd Street Library branch. Designed by her firm and completed in June, the new facility opposite the Museum of Modern Art occupies the site of the former Donnell Library Center, which it shares with the new 50-story Baccarat Hotel & Residences designed by Skidmore, Owings & Merrill. While the location is excellent, the space presented many challenges. 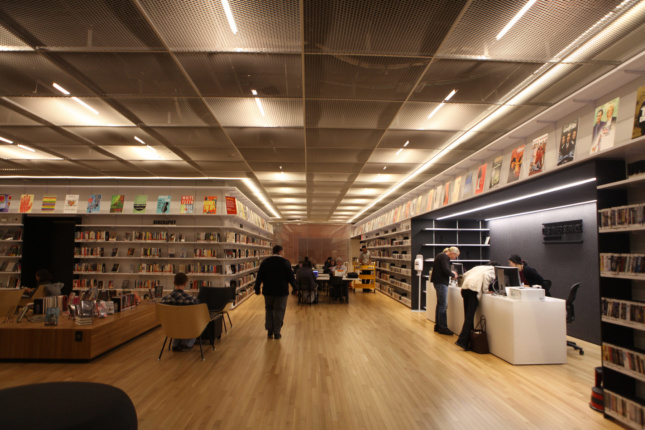 The library occupies three levels, one at street level and two below grade, with only fifty feet of street frontage. 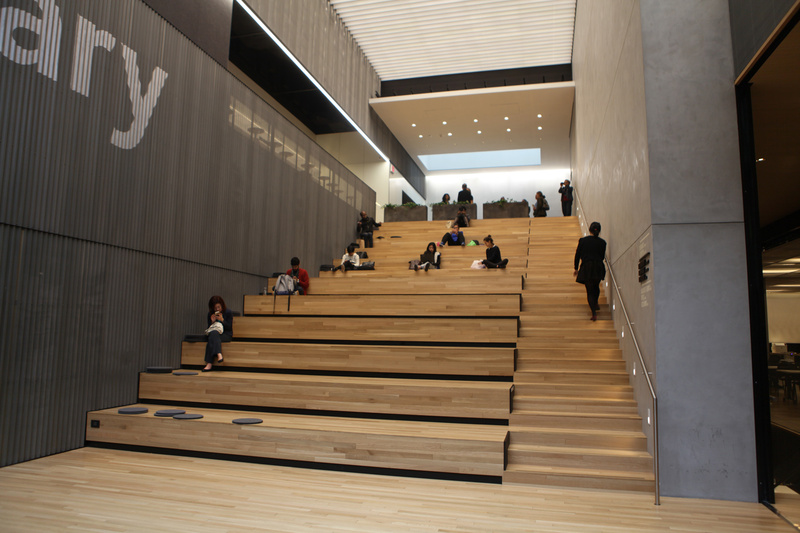 The majority of the library lies below the new tower and, as a result, it had to be planned around a massive sheer wall and a large elevator core. In certain locations the floor slabs are sloped, penetrated and pulled back, thereby creating multi-story spaces and openings to introduce natural light to the lower levels and diminish the perception of being subterranean. Architect and client sought to make the library as open and inviting to the public as possible and to encourage dialogue with the city. 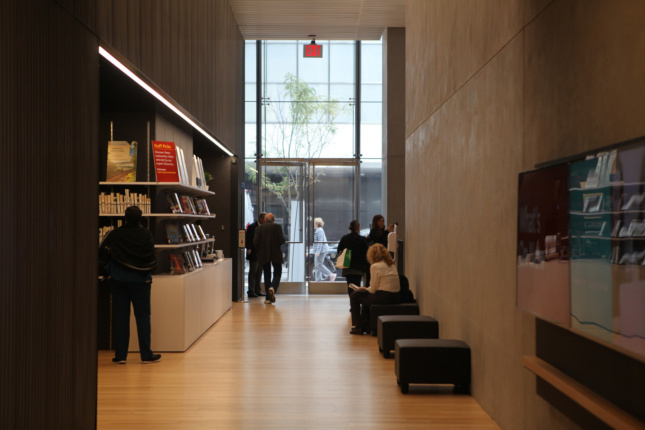 Public engagement was one of the main objectives of the design and remains an important goal of the library’s programming, which has already included after-hours concerts, opera performances, and presidential debate screenings. To draw people in, the building’s facade is extremely open and transparent, offering views to the stepped Main Hall, a multi-use space that connects the street level with the Central level below. Responsible for interior design as well as architecture, TEN Arquitectos have created a lively and engaging space. Materials such as exposed architectural concrete, corrugated perforated metal, wood floors, felt, and ceilings of metal grating were selected to express, in Steele’s words, “the tectonics of the city.” Sleek contemporary furnishings recall designs of Prouve and Aalto. 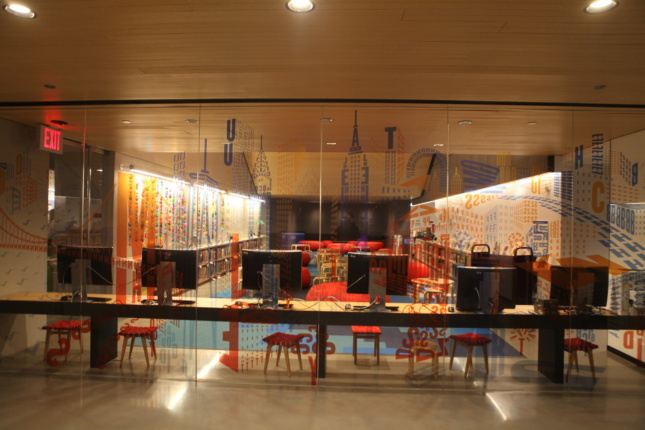 Bold environmental graphics were provided by 2×4, who also created a playful mural in the children’s area referencing New York landmarks. About the author: John Shreve Arbuckle, Assoc. AIA guides the AIANY Around Manhattan Architecture boat tours, and organizes and guides tours through Arbuckle Architecture Tours, LLC. He is the President of DOCOMOMO New York/Tri-State, a local chapter of an international organization devoted to documenting and preserving Modern architecture.